Love M&Ms? Alex Harris does—except for the blue ones. She thinks they’re unnatural. She also has a distaste for mannequins, clowns and dead bodies. Alex and her sister Samantha own Always Prepared, a temp agency. Business is slow so when a call comes in for a temp to work on an urgent mailing for Poupee’ Mannequins, Alex goes to do the job herself. It just might be the chance to pitch their agency for a big job coming up. The usually unflappable Mrs. Scott is having a bad day that gets fatally worse and Alex is the one to find the body. The upside is that Alex gets her chance to talk to Mr. Poupee’ and meet hunky Detective Van der Burg, although neither is under ideal circumstances. Motives abound—was the elderly Mr. Poupee’ having an affair with the staid Mrs. Scott? Is it true Alex and Mrs. Scott argued? Could the beautiful and mysterious Emmanuelle be involved? After all, she left her last two jobs under a cloud of suspicion. Is someone cooking the books? Mrs. Scott seems to have thought so and the orders vs. shipments seem out of whack. Then there’s Mitch the designer, Jerry the factory foreman and Richard in sales, all with possible motives. Alex is hired to fill in for Mrs. Scott and that gives her a chance to snoop as well as opportunities to see Detective Van der Burg again—that’s going well. Between questions about the murder, she finds he eats the blue M&Ms; surely, that’s a good omen! Side characters of Samantha and Millie in the temp office are believable and fun. Grandma is a hoot—she cheated at bingo and has been suspended from playing at St. Michael’s so Alex has to take her to a bingo hall where she’s not so well-known. And did I mention Grandma is also a loan shark of sorts? Be warned—do not have food or drink in your mouth as you start chapter twenty-nine. You’ll choke and never find out who dun it! The story of Grandpa (other side of the family) at the assisted living facility will stay in my mind. I can only hope the people at Fazolli’s forgive my outburst as I read while eating dinner. A second spew warning is needed as the girls (Samantha, Alex and Millie) make a midnight foray into the Poupee’ Mannequins factory and offices to search for clues. Millie makes an awful lookout, mannequins start to move and the jig is up. The plots and subplots, good characters and detailed settings are a great read. Make a cup of tea, grab a scone or just a handful of M&Ms and settle back to find out who did it and why—and if there’s anything going on between the detective and the temp. Macko and Alex recommend Earl Grey or orange/cinnamon tea. Learn more about Elaine on her website. To enter to win a copy of Armed & a box of Stashed tea from Classical Coffee, simply email KRL at life@kingsriverlife[dot]com by replacing the [dot] with a period, with the subject line “Armed”, or comment on this article. A winner will be chosen June 1, 2012. U.S. residents only. To purchase some of this great coffee, check out Classical Coffee Company online where you can find coffee recipes as well coffee store! Nice review. Sounds like an enjoyable book. 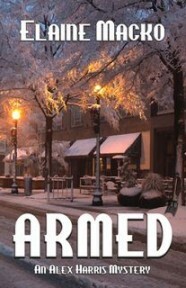 ARMED was a hoot and I am ready for the series.